On Saturday, December 8th the Legion Volleyball Club (LVC) in conjunction with the Niagara Frontier Volleyball club will host some of the top players in the northeast and a former Olympian as three teams visit Buffalo to compete in the National Volleyball Association (NVA) North East Regional. 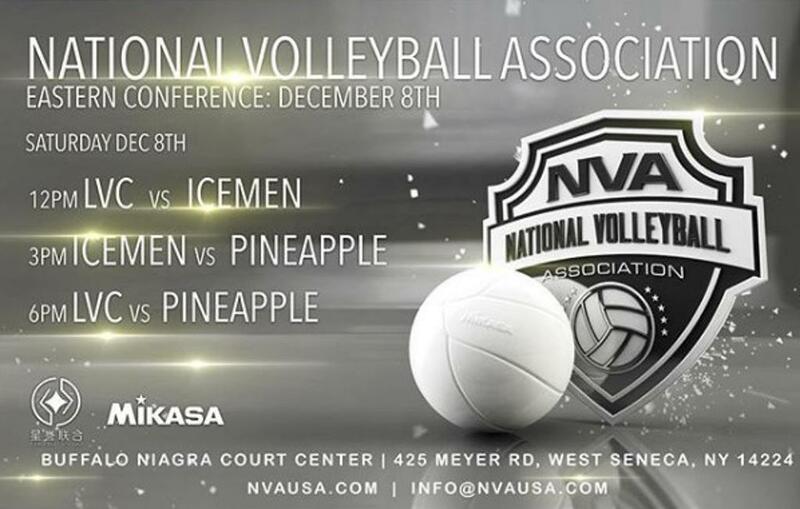 Team LVC, Chicago Iceman and Team Pineapple, will hold center court at Niagara Frontier Sports (formerly known as the Buffalo Niagara Court Center) at 425 Meyer Road in West Seneca. The three men’s matches will be live streamed and viewed by volleyball enthusiasts all over the world. More info and live streaming links for the event can be found at the National Volleyball Association web site at http://nvausa.com. There will be a $5.00 admission fee at the door for spectators. Those names receiving tickets prior to the event can check in at the will call table. Not only is the Niagara Frontier Volleyball club honored to help Team LVC host the NVA players at their third regional event of the season but they are also proud of the relationships and history they have had with a number of NVA team participants. Team Pineapple is led by 2008 Olympic volleyball gold medalist, Lloy Ball. A 6’8” setter, Ball was a member of the American national team from 1993 through 2008, a participant of the Olympic Games (Atlanta 1996, Sydney 2000, Athens 2004) and gold medalist in Beijing 2008. He was also a gold medalist of the NORCECA Championship 2007 and World League 2008. His last time competing in Buffalo, NY was during the 1993 World University games. Also on the Team Pineapple roster is former Frontier High School standout, Jeff Ptak. Jeff was born in Hamburg, NY and started his international career at the age of 17 while playing for the US Junior National team. He was a standout NCAA player for Indiana Purdue Fort Wayne. Over the course of his career, Jeff has played on 20 different professional teams. Last fall, Ptak brought Team Pineapple teammates Ivan Matos and Jorge Ralat to Buffalo to run a very successful junior volleyball clinic at Niagara Frontier Sports which they plan to run again in the spring of 2019. The Legion Volleyball Club out of Albany, NY is led by Christopher Hosley a 6’2” right side hitter who frequents the indoor courts at NFVB in adult tournaments as well as the New York Outdoor Volleyball Association (NOVA) beach series in Rochester and Buffalo. The LVC roster includes 6’4” right side, Alex McColgin, a First-Team All-Western New York selection who attended Hamburg High School and Niagara Frontier boys coach and former Eden High School standout, Justin Waldorf. Helping to coach the team is Christopher “CJ” Denk who many Western New York players have seen on center court at the beach or on the sidelines, coaching the Paradigm junior girls’ volleyball club. Team LVC has also added 2017 NCAA National Championship setter, Christy Blough from Rochester. Western New York has a history of producing high level volleyball talent that has gone on to represent the region across the USA and around the globe. Born in Buffalo, NY, Matt Anderson is currently one of the top volleyball players in the world as a member of both the United States men's national team and the Russian club Zenit Kazan. Matt represented the Buffalo volleyball community in the 2012 Olympic Games and was a bronze medalist in the 2016 Olympic Games. The NVA attracts similar talent and hopes to generate interest in expanding the competition in the league as well as potential sponsors.